February 7, 1943 -- The sky falls when Michael "Hinky Dink" Kenna misses his first Sunday afternoon pre-election meeting of the First Ward Democratic club in 46 years. The 5' 1" Kenna, who, along with "Bathhouse" John Coughlin, ran the most notoriously wicked, graft-driven ward in the city, controlled "The Levee" for another three years until his death at 89 in October of 1946. John Budinger, who had been chosen to replace Kenna on the City Council said of the "empty chair" at the meeting, "When our leader called me in and told me I had the privilege of being his candidate for alderman, it was the grandest thrill that ever happened to me." 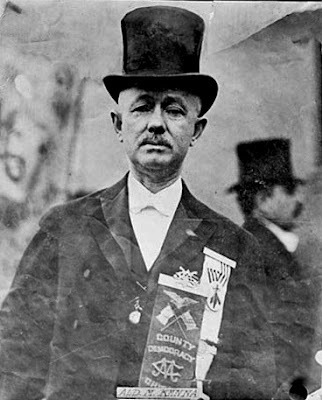 Chief Bailiff Albert J. Horan assured Budinger that he would have no trouble winning the seat, one way or another. He said, "We are not afraid of cries of investigation, for we are as open as babes in their mother's arms."